Sweet treats are a great addition to almost any event, from formal weddings and corporate events to holiday parties, fundraisers and many more. Our chocolate fountain rental is the king of sweet treats, providing a visual spectacle and a delight for the taste buds. Kids and adults alike enjoy the chocolate fountain, with endless options to make individual chocolate-covered treats including chocolate pretzels, chocolate-covered fruits, chocolate doughnuts, cookies, or even chocolate-covered chocolates! Place your chocolate fountain at the center of your food trays to make an extra sweet spectacle or save your chocolate fountain until after dinner to present with your dessert tray. The chocolate fountain is always a crowd pleaser and works well with small gatherings or big events. We give you everything you need to get your chocolate fountain started and help you find the perfect place for it. The chocolate fountain is best for inside events and creates a perfect centerpiece for holiday parties, corporate events, weddings, birthday parties, family reunions, class reunions and more. 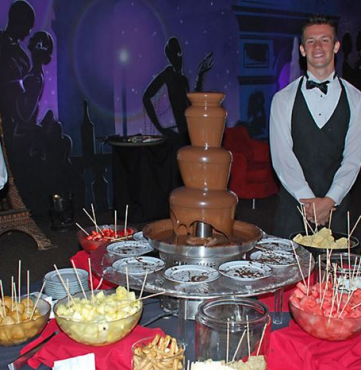 Reserve a chocolate fountain rental in Boston and other areas of Massachusetts today. Call (888) 752-0628 or locally (978) 767-2107 to learn more about this and many other food, furniture and entertainment rentals at your party.